The celebration of JAD's 20th celebration continues this month with not one but two new publications. 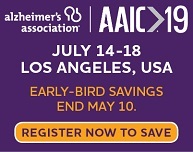 At AAIC 2018 in Chicago, will be presenting a special edition commemorative publication for JAD's 20th anniversary that looks back, as well as forward, to the journey that lies ahead for AD research. Discover the milestones that have led to JAD becoming a vehicle for more papers on AD than any other journal, receiving more citations than any other AD-focused journal. Read on for more details. JAD is pleased to announce that Greg Kennedy, a PhD candidate at the Centre for Human Psychopharmacology, Swinburne University of Technology, Hawthorn, Australia, has been chosen as the recipient of the 2018 Alzheimer Award. Ground-breaking new research has identified a unique combination of nutrients to slow the progression of Alzheimer’s Disease (AD), which affects over 520,000 people in the UK and represents a burden on the struggling NHS of over £26 billion per year. 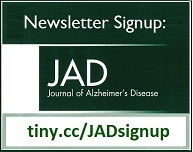 The 18-month study, published in the June edition of the respected Journal of Alzheimer’s Disease (JAD), examined the effect of nutritional compounds - found in common foods such as trout, broccoli, and peppers on people with the condition, and unveiled a ‘statistically significant’ find. 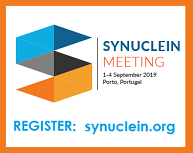 An age group analysis of data from the ADvance trial has shown that participants over the age of 65 continue to derive the most benefit from Deep Brain Stimulation of the fornix (DBS-f), as observed in the data from the phase 2 findings (12 – 24 months) of the Phase II trial. The rate of decline in certain aspects of memory may be explained by a combination of overall physical fitness and the stiffness of the central arteries, researchers from Swinburne’s Centre for Human Psychopharmacology have found. A study to be published in the Journal of Alzheimer’s Disease considers the mechanisms underlying cognitive performance in older people living independently. Lead author, PhD candidate Greg Kennedy, says that from early adulthood, memory and other aspects of cognition slowly decline, with an increasing risk of developing into dementia in later life. Body-worn sensors used at home and in clinic by people with mild Alzheimer’s to assess walking could offer a cost-effective way to detect early disease and monitor progression of the illness. A pilot study involving Newcastle University has revealed low-cost wearable devices could improve clinical trial efficiency and encourage research investment. 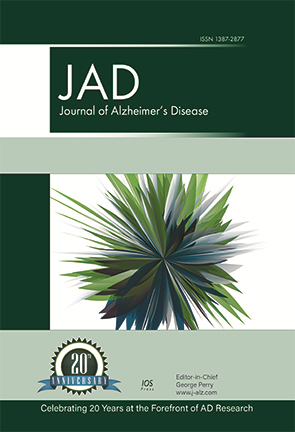 IOS Press is pleased to announce that 2018 marks the 20th anniversary of the Journal of Alzheimer’s Disease (JAD). 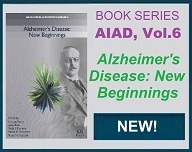 One of the many events celebrating this milestone is the publication of an open access issue (JAD 62:3) looking back at 20 years of Alzheimer’s disease (AD) research, which is now available online. What if you could know that your mild cognitive impairment wouldn't progress in the next decade through the result of two simple neuropsychological tests? 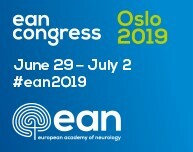 Researchers from the Lisbon School of Medicine, University of Lisbon found that, in some mild cognitive impairment patients, real neuropsychological stability over a decade is possible and that long-term stability could be predicted based on neuropsychological tests measuring memory and non-verbal abstract reasoning. In a large population-based study of randomly selected participants in Germany, researchers found that participants aged 65-74 years with olfactory dysfunction showed impaired cognitive performance. Interestingly, this strong association was not present in younger (55-64 years) or older (75-86 years) participants. Additionally, the effect was more present in women than men. Can a Smell Test Sniff Out Alzheimer’s Disease? Columbia University neurologist William Kreisl, MD, has been studying a smell identification test and explains what it can – and can’t – say about Alzheimer's. His most recent study appears in the Journal of Alzheimer’s Disease. Here, he provides further explanation about his research.